Officials have confirmed a domino-like bus accident has happened in the Medford Lakes, New Jersey area. More details are forthcoming. Reports have surfaced about a car crash that occurred in Medford Lakes, New Jersey on Monday. The accident happened when five different school buses were following each other from a summer day camp. It’s unclear exactly what occurred in the moments leading up to the collision, but photographs of the accident scene suggest the buses hit each other in a domino-like effect. 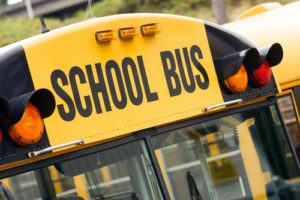 The impact cracked several of the bus’s front windshields, shattered parts of the front doors and dented both the front and rear ends of several vehicles. It appears that no other vehicles were involved in the school bus crash. Photographs of the aftermath are haunting, but thankfully none of the passengers were severely hurt. Local hospitals accepted 24 patients from the accident scene who suffered minor personal injuries. Police have not yet made any statements regarding their investigation into the cause of this accident. Victims who sustain injuries after a bus accident can quickly accumulate losses in the form of medical bills, prescription payments, missed time from work or school, physical pain and emotional suffering. At the Law Firm of Rudnick, Addonizio, Pappa & Casazza, we work hard to ensure the party at fault bears the burden of these financial losses. We will fight for you while you put your focus on your and your family’s well-being. Our firm has been assisting injured victims for over 40 years, so you can rely on our knowledge and experience. Contact our firm today by messaging us online.